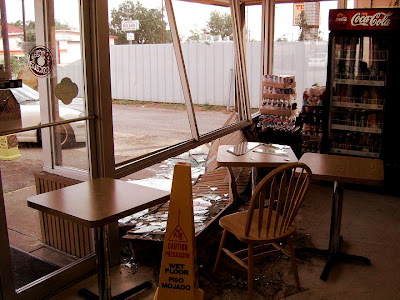 Well, the excitement today at Shipley's donut was that an elderly customer in a van hit the gas instead of the brakes as he pulled into the front parking space. And, you can see the rest. 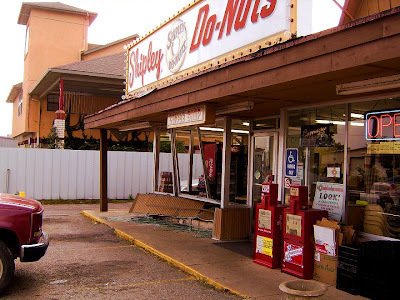 The owner of Shipley's was on the phone trying to get an insurance adjustor out to Terrell on a Sunday morning to view the damage. She said the van had came through the window about 30 minutes before we arrived, and didn't damage the vehicle at all! I think I'll pass on a window seat. Somewhere at the back of the store will be fine! Wow! You did get some good photos of the mishap, Brian. I'm glad you and Grandma weren't there for the excitement. Did you still get your doughnut and coffee? Hope so.